With just 1 month until travel peaks during the holiday season, there are still no official updates from the federal government on the changes to DUI admissibility when crossing the border into Canada. Old DUI convictions will prevent millions of people from entering Canada unless they apply for either Rehabilitation or a Temporary Resident Permit. When Bill-C-46 becomes law on December 18th millions of people with an old DUI conviction may not be allowed to legally enter Canada. ‘Deemed rehabilitation’, the process that currently allows entry to Canada with an old DUI, might no longer be an option as Bill-C-46 raises the maximum penalty for a DUI in Canada to a 10 year sentence. As a consequence of Bill-C-46 old DUI charges that are currently considered “common criminality” will be reclassified to “serious criminality” which in turn invalidates entry to Canada by way of “deemed rehabilitation”. See the definition of “deemed rehabilitation” below and note the text in red. Since the bill received royal assent on June 21st 2018 there have been no official updates from the federal government despite the fact it will affect millions of people crossing into Canada. With the enormous impact of the new legislation on everything from shipping to tourism we expected to see proposed changes to the legislation fast tracked. Instead, all we have is one statement from the immigration minister. Back in September Immigration Minister Ahmed Hussen made a statement to the media: “anyone deemed rehabilitated for an impaired driving offence outside Canada before December 18, 2018,” “would not need to reapply for relief to overcome inadmissibility due to that same offence.” The statement that the bill will not being retroactive sounds positive but hasn’t done much. From what we know the CBSA will still be enforcing the legislation as is. In fact, the CBSA website shows as of November 16th that the consequential changes Bill C-46 might indeed be enforced despite the media comments. 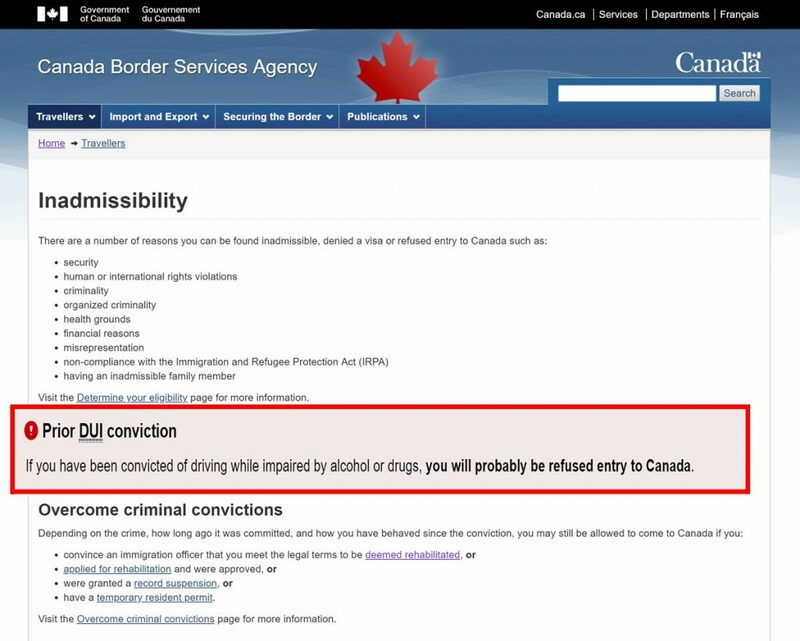 On another page of the CBSA website the agency spells it out clearly – a DUI will probably deny entry to Canada. It is certainly still possible to overcome having a DUI conviction and enter Canada. An application for a Temporary Resident Permit or Rehabilitation request is available as a way to enter Canada with past convictions, including DUI’s. The new legislation will not effect one’s ability to be approved for these applications. To help you decide which is best for your situation, we offer free consultations to assess your case. Simply call us at (204) 488-6350 or 1-800-438-7020. Alternatively you can also use the our contact form on this page.